Beth Mead celebrates her winning goal against Brazil on Wednesday. 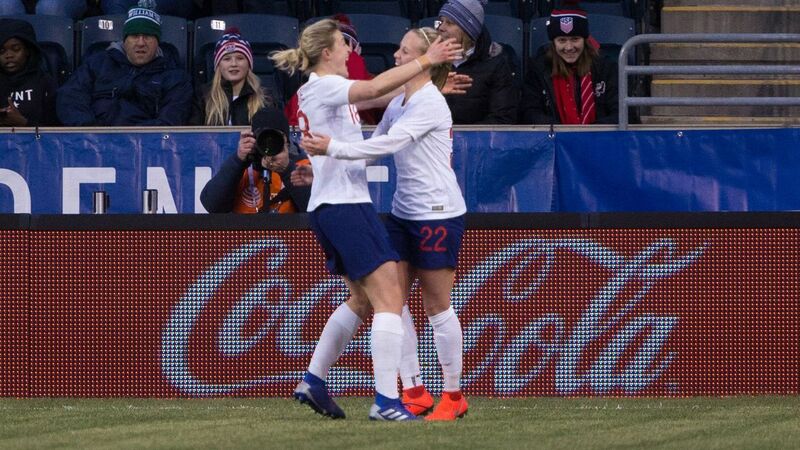 Beth Mead scored the go-ahead goal in the 75th minute and England defeated Brazil 2-1 Wednesday in the opening match of the SheBelieves Cup tournament in Chester, Penn. Andressa Alves converted a penalty kick in the 16th minute to give Brazil the early lead before Ellen White equalised with a shot to the bottom right corner early in the second half. It was White's fourth goal in SheBelieves Cup games. England and Brazil are bound for the Women's World Cup, which kicks off June 7 in France. ESPN's Julie Foudy feels Jamaica's World Cup group consisting of Australia, Italy and Brazil will prove to be too much for the debutants. Australia are set to face Brazil for the fourth consecutive time at the Women's World Cup after Saturday night's draw in Paris placed the Matildas in Group C, along with Italy and Jamaica. Of their three opponents, Brazil poses the toughest, yet most familiar, challenge for Australia in the group stage. With 18 previous meetings against As Canarinhas, the honours are fairly even with the Matildas winning nine, losing eight, with one match ending in a draw. England's women's team beat Brazil 1-0 at Meadow Lane on Saturday with Fran Kirby scoring the only goal of the game. The winner came after only two minutes when Kirby headed home Nikita Parris' fine cross. Brazil suffered an injury blow early in the game when Marta was forced off with a hamstring injury. Parris was a threat throughout the game but her creativity could not produce a second goal for the Lionesses. BRISBANE -- The Matildas have reinforced their supremacy over Brazil with a 3-1 win to open the defence of their Tournament of Nations crown with a bang. Two first-half goals from corner kicks and a Samantha Kerr stunner booked Australia their fourth consecutive win over the South Americans.